BAKED RICE PILAF — Rice and toasted orzo are mixed with colorful vegetables and chicken broth, then baked until light and fluffy. Nothing makes a better side dish, in my opinion, than a good rice pilaf. And this colorful, Baked Rice Pilaf is my all time favorite! 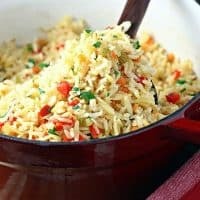 This pilaf is a combination of white rice and orzo, toasted in a skillet then mixed with veggies and a savory broth and baked until light and fluffy. You definitely don’t want to skip the toasting step. It adds tons of color and flavor to this savory side dish. I just love how pretty this looks with the peppers, carrots and green onions. And my kids hardly notice that I’m serving them vegetables. A handful of fresh herbs tossed in just before serving also adds great color and flavor. 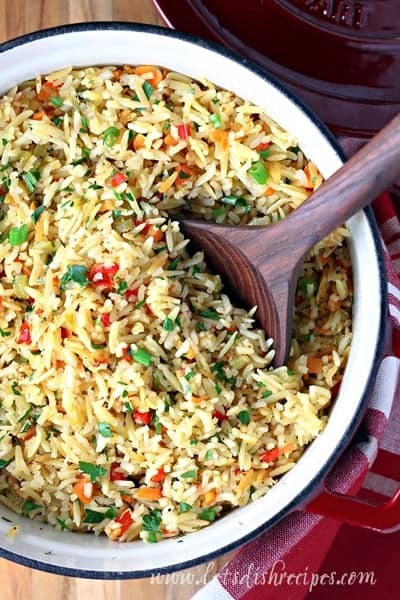 This rice pilaf goes well with beef, pork or chicken. You could even add cooked meat right to the pilaf itself for a complete, one-pot meal. This does take a bit longer to cook than your typical rice dish, so make sure to leave yourself about an hour to finish it. But I love that once this rice pilaf in the oven, you can forget about it while you concentrate on making your main dish. It’s the kind of side you’ll make again and again because it’s so easy and convenient. And it’s versatile too. You can easily switch up the vegetables and herbs to use whatever you have on hand. Even frozen veggies, like peas or corn, would work well. This is a side dish that’s fancy enough to serve for a holiday meal, but easy enough to throw together on a week night. And my whole family loves it. You really can’t go wrong with this Baked Rice Pilaf. Be sure to save this Baked Rice Pilaf recipe to your favorite Pinterest board for later. Rice and toasted orzo are mixed with colorful vegetables and chicken broth, then baked until light and fluffy. Sauté onions celery and garlic until softened, about 3-4 minutes. 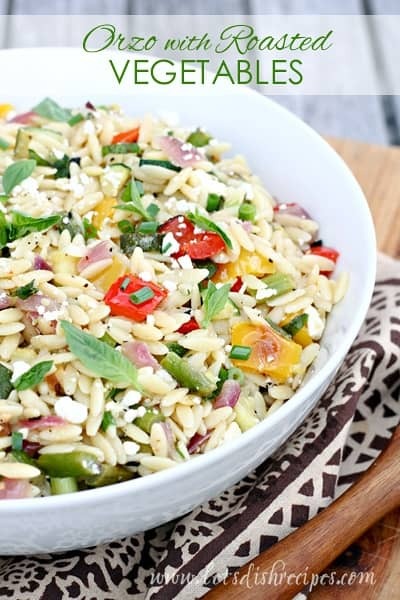 Increase heat to medium-high and stir in orzo. 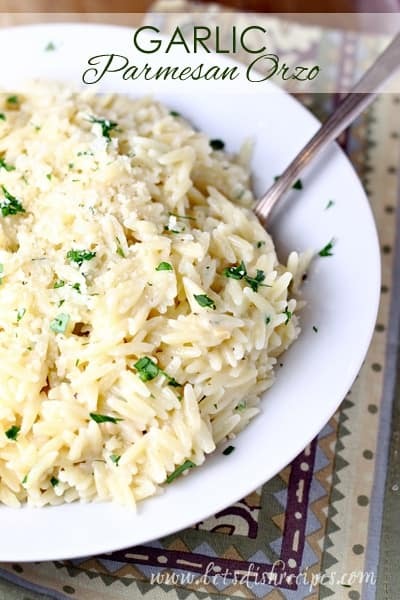 Toast until orzo is a deep, golden brown, 5-7 minutes. 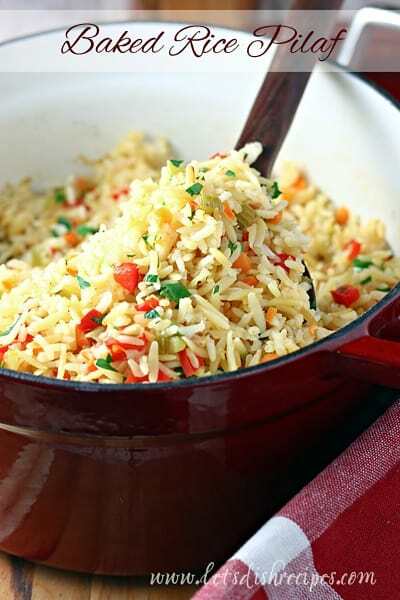 Stir in the rice, carrots and peppers and pour into a large, covered casserole dish. Pour one cup of the chicken broth over the rice mixture and stir. Cover and bake for 25 minutes. When time is up, remove lid and stir in the remaining broth. Cover and bake for an additional 35 minutes, or until rice is tender. Fluff rice with a fork, then season with salt and pepper, to taste. Stir in green onions and parsley just before serving. This recipe is fantastic! I must admit I was sceptical about the process, but followed it as directed and was thrilled with the fluffy results.